Chewbacca is taking time away from the family this Life Day to stay at your home for the holidays! This furry Chewbacca-themed wreath will make your guests feel right at home from the moment they spot it on your front door. Add the ornament or a Wookiee action figure to clue in guests who might not easily recognize Star Wars characters, or leave it with just Chewie’s bandolier. Step 1: Begin by wrapping the measuring tape around the wreath to measure its circumference. 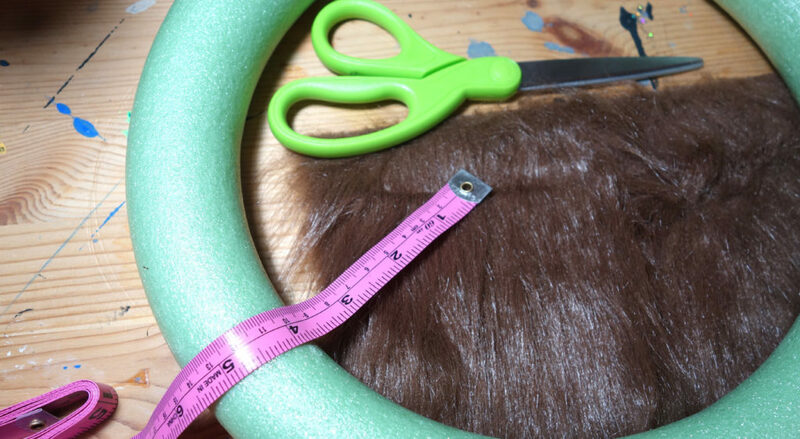 Step 2: Cut pieces of the brown craft fur as wide as the circumference you measured so that each piece fits neatly around the wreath. 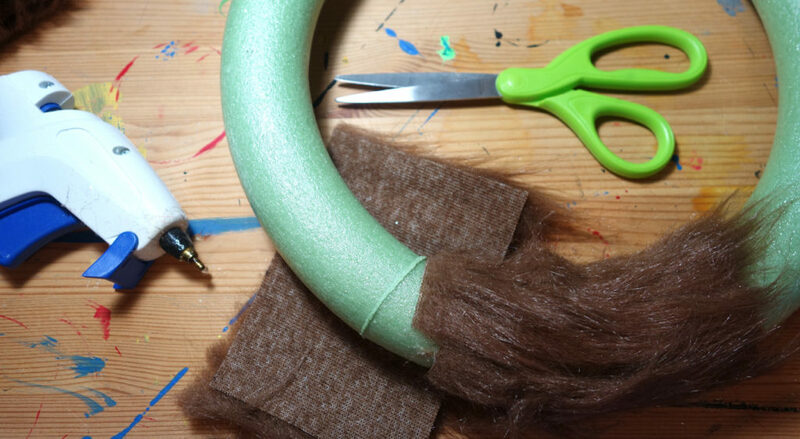 Shorter pieces are easier to glue on the wreath, so don’t cut the fur longer than four inches or so. Step 3: Once you have cut several pieces of craft fur, begin wrapping them around the wreath and hot gluing them to the foam. 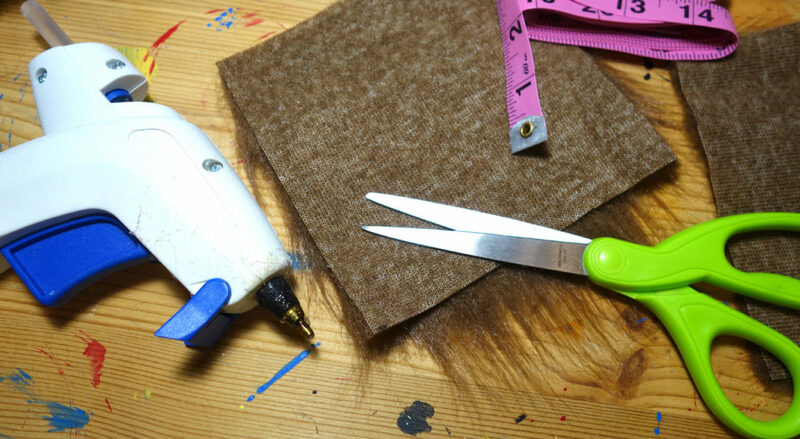 Note: Make sure each piece of fur is adhered in the same direction and slightly overlap for a smoother look. Also, place the lengthwise “seam” of the fur pieces all on the same side of the wreath for the same reason. Step 4: Continue gluing the fur until the entire wreath is covered. 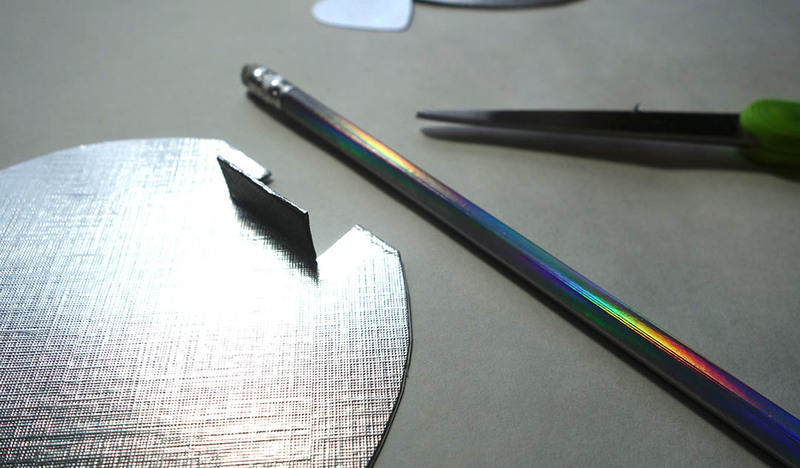 If you missed any small areas, cut and glue small pieces of fur to fill it in. Step 5: Wrap the wide gold ribbon once around the wreath on the top right, and glue the ends down on the same side as the fur seams. Step 6: Wrap the brown ribbon once around the gold ribbon and glue it down. Step 7: Hot glue the large white jingle bells to the brown and gold ribbon, evenly spaced, to finish the bandolier. Step 8: Cut a long piece of gold ribbon and a shorter piece of brown ribbon. 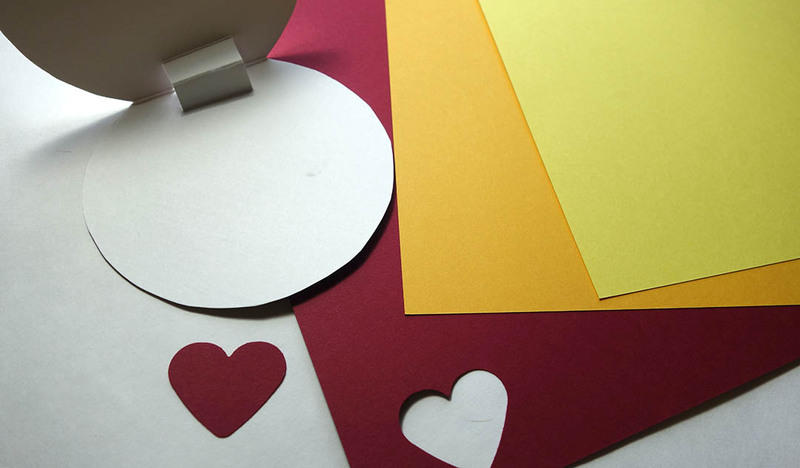 Fold the gold ribbon into a loop, and then wrap the brown ribbon around it to make a bow. Glue the ends down and adjust the gold ribbon until you have a neat bow. Glue it to the bottom of the bandolier. 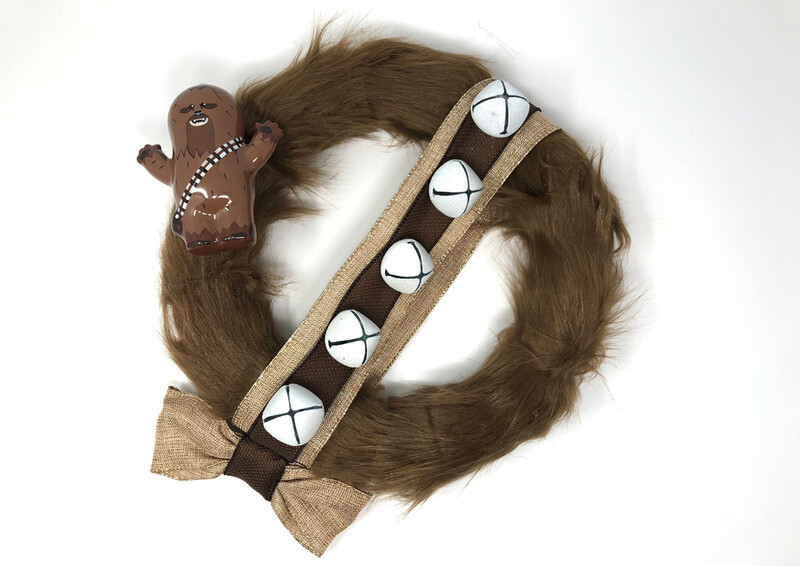 Your Chewbacca wreath is complete! Ho-ho-hhhaaargghhh! Gorgs are delicious treats both on Star Wars Resistance’s Colossus station and in real life. But did you know they also make a perfect holiday decoration? Papier-mâché, wooden beads, clay, paint, and a splash of glitter combine to add a little personality to your holiday decorations, kids’ playrooms, or refueling station. Step 1: Begin by hot gluing the two wooden beads on top of the ornament on either side of the hanging string, opening side down. Let cool. 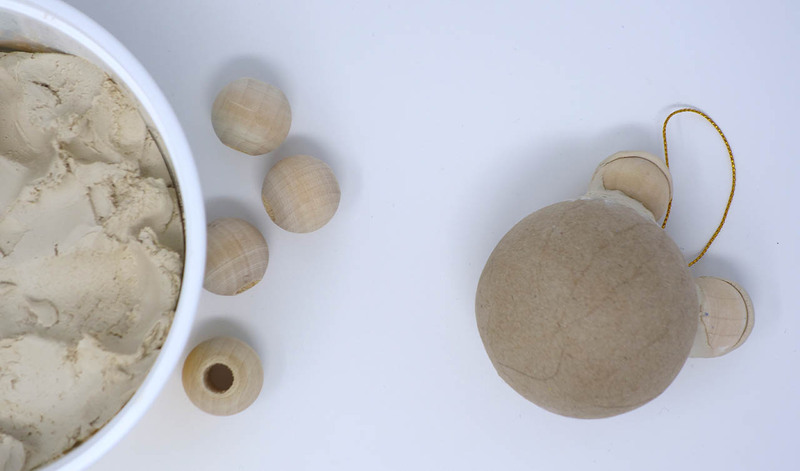 Step 2: Fill in the openings on the top of the beads with the air-dry clay and let dry. Step 3: Next, use the air-dry clay to fill in around the sides of the bead, making the eyes look attached to the gorg’s body (the ornament). 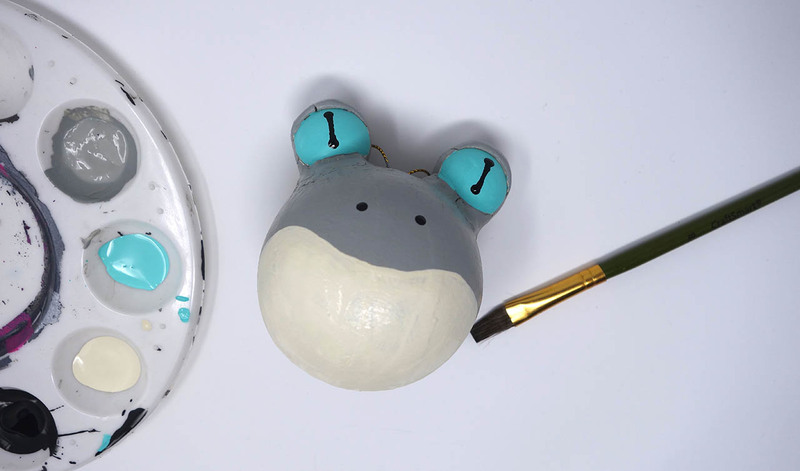 Step 4: Shape eyelids for the gorg with the air-dry clay, and gently press the clay to the top of the wooden bead. Blend as needed and let all clay dry completely, preferably overnight. Step 5: Paint the belly of the gorg with the cream-colored acrylic paint. Paint the body and the eyelids with the grey paint and let all paint dry. Step 6: Paint the gorg’s eyes turquoise and let dry before adding the pupils with the black paint. 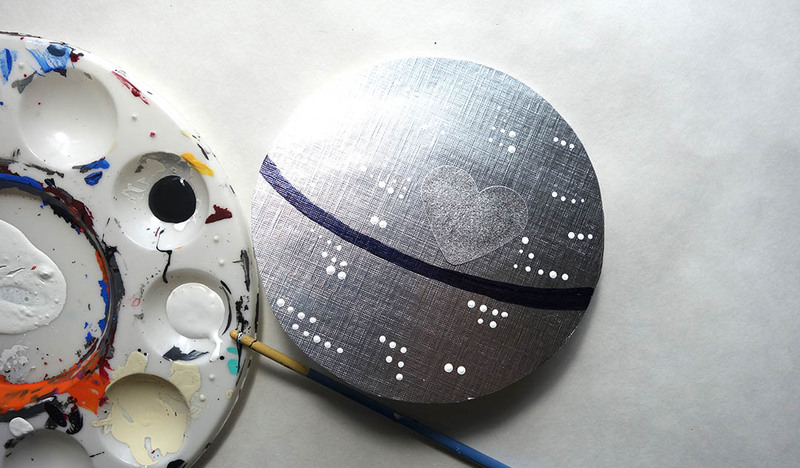 If you’re having trouble with the small dots in the pupils, dip the other end of the paint brush in the black paint and gently dot it on the wooden bead. 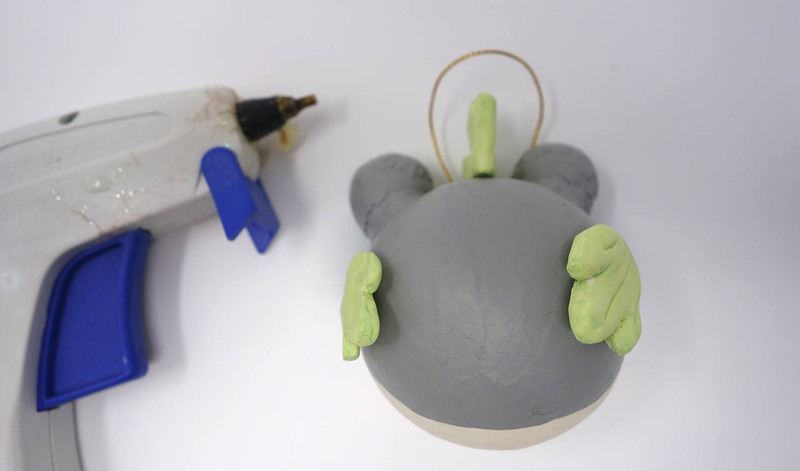 Step 7: Add two black dots on the front of the ornament for the gorg’s nose. Let all paint dry completely. 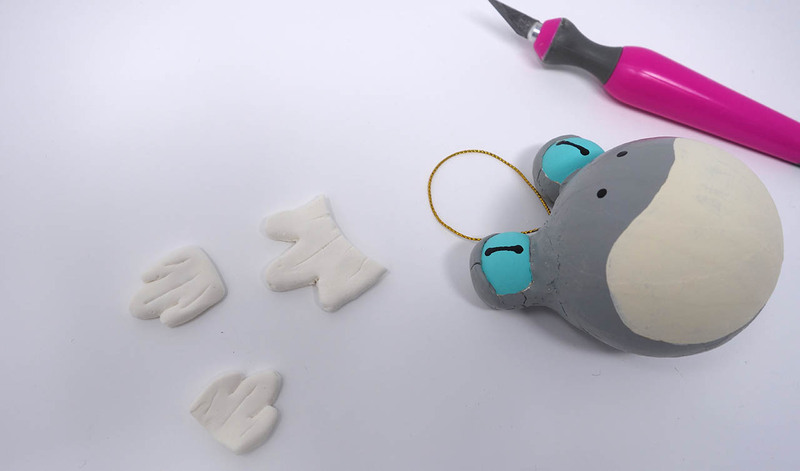 Step 8: Use the Model Magic clay to make three small fin shapes. One will be the larger fin on top of the gorg’s head, and the other two will be smaller fins for the back of the ornament. Let the clay dry overnight. Step 9: Paint the fins a pale green and let dry. Step 10: Hot glue the larger fin to the top of the ornament, and the two smaller fins on the back side. 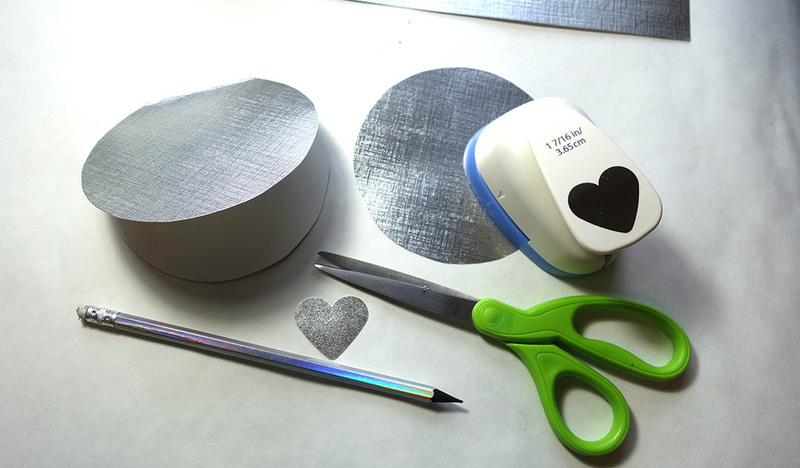 Step 11: Use silver or holographic glitter glue over the dry grey paint and let the glitter dry completely. Repeat on the belly with a white glitter, and let dry. 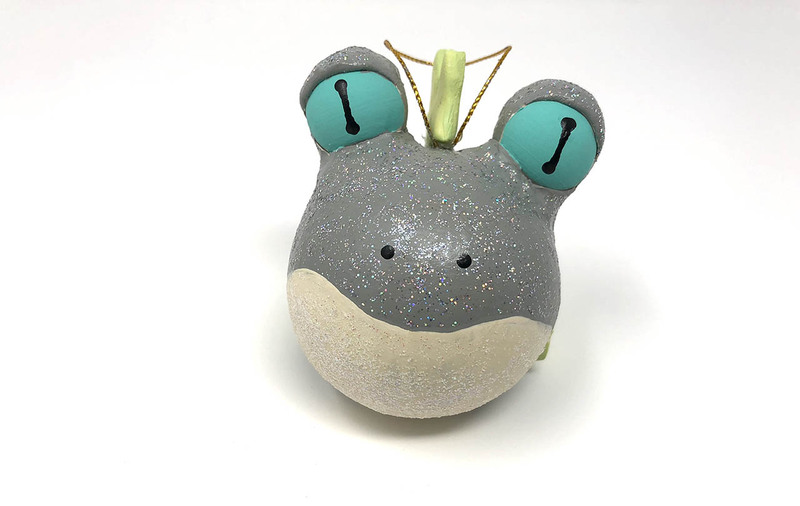 Your gorg ornament (or, if you prefer, gorg-ament) is complete! Make it together with your kids to celebrate Star Wars Resistance and the holidays this winter. I never imagined I would give my dog a makeover. But when Oh My Disney! contacted me to see if I wanted to give my pet, Chuy, a Star Wars makeover, how could I resist? I immediately said yes, while my dog celebrated his good fortune with a nap on the couch. Chuy is my 12-year-old Chihuahua, and he’s gotten used to being dressed up in my handmade creations. Over the years, I’ve dressed him up as Ebenezer Scrooge, a Star Destroyer, and most recently, a porg! One character I’ve always wanted to dress Chuy as is Salacious B. Crumb. 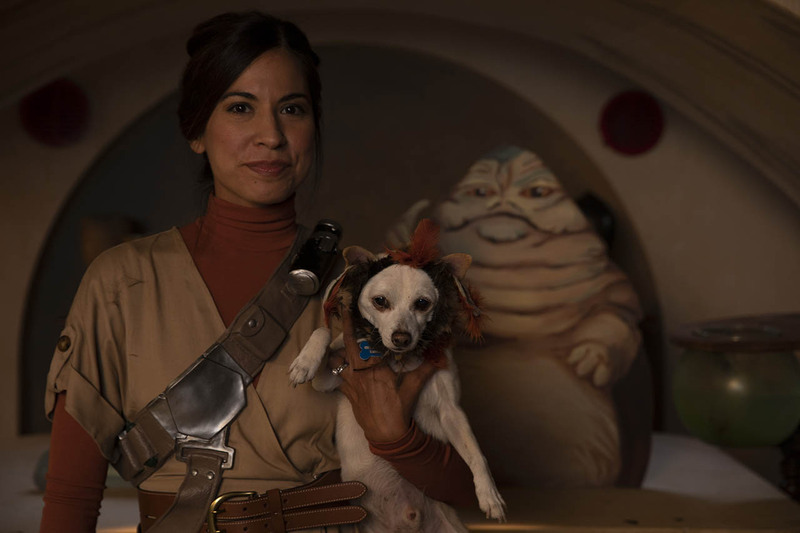 Not only is Salacious one of my favorite Star Wars creatures, but Kowakian monkey-lizards and Chihuahuas do look similar. 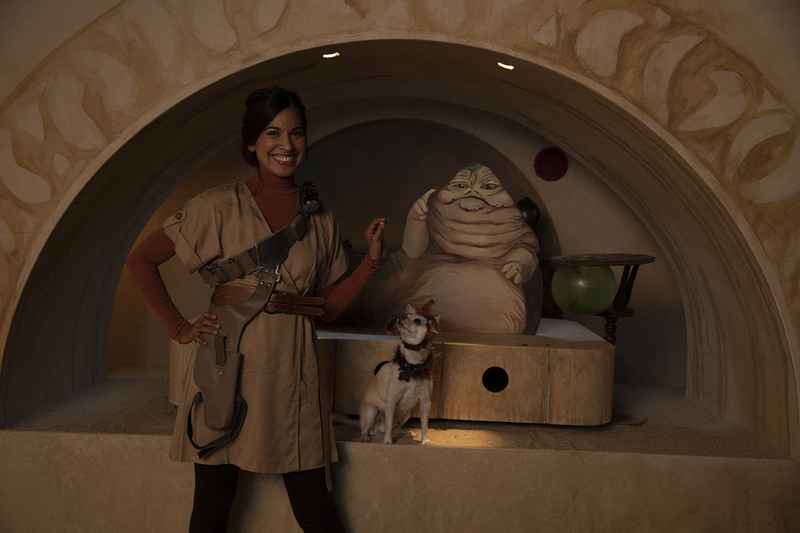 When I arrived on set for Star Wars Pet Makeovers by Oh My Disney, Chuy and I didn’t know what to expect. We got whisked away into hair and makeup (for me) and then we met with costume designer, Ngozika Okeke to discuss outfit options. I got a little distracted by all the incredible-looking Star Wars masks and helmets. [Insert Tusken Raider battle cry here.] Thankfully, Ngozika helped me get back on track when she shared some of her ideas for Chuy’s makeover. I also showed her the Boushh-bounding outfit I had put together for the photo shoot. After we added a makeshift bandolier to my ensemble, it was time for Chuy’s big moment. Chuy’s Salacious B. Crumb makeover was perfect. Ngozika made his costume from feathers, which meant the pieces were extremely lightweight and easy for my little guy to wear. 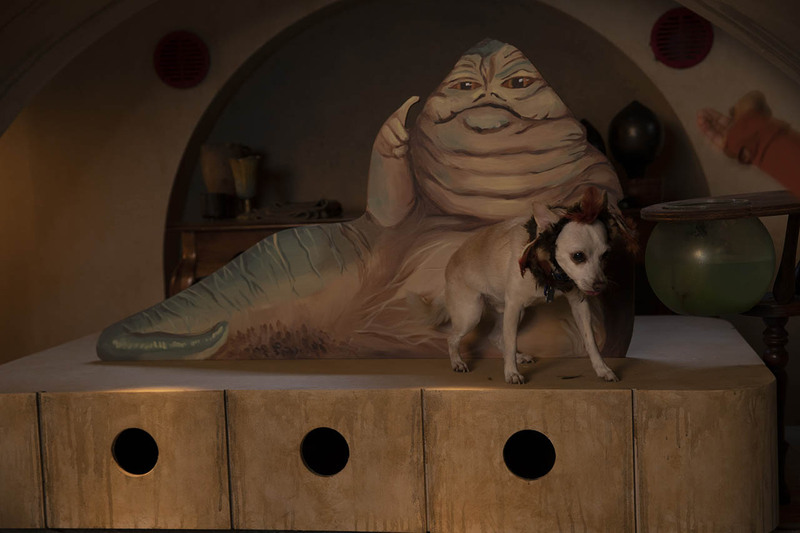 My Return of the Jedi dreams were realized when I saw the dog-sized Throne Room, complete with a small Jabba the Hutt! I was floored by how screen-accurate the set looked and how it was tailor-made for Chuy. Bounty hunters aren’t supposed to smile but I couldn’t stop beaming during the photo shoot. The photo shoot was a mixture of fun and hilarity, but it also ended up being a special day for both of us, I think. As I mentioned earlier, Chuy is a senior dog. He’s got a lot of energy left but he’s definitely in his twilight years. And after my daughter was born, he moved to a lower rank in the pack. So the makeover ended up being a chance to spend some quality time with my little buddy — hanging out, laughing, eating treats — just like Jabba and Salacious B. Crumb. If you’re interested in dressing up your furry friend, here are my 5 pet costuming tips! 1. Know your dog. The most important thing when picking out your pet’s costume is to know what they will feel comfortable in. Some dogs don’t like having their legs or paws covered. Other dogs are happy to sit in an Ewok hood and body suit all day. 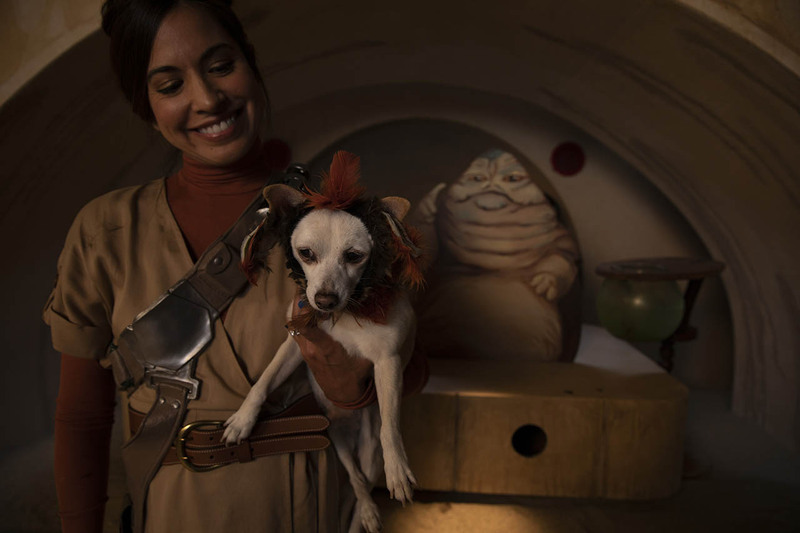 If this is your pet’s first time dressing up, try something easy-to-wear like Yoda ears or a BB-8 hoodie. This will give you a better sense of what their comfort level is…and whether they’re ready to rock that Han Solo wig and vest. 2. Choose fabrics wisely. Once you know your dog’s comfort level, it’s time to think about fabric options. Soft fabrics like fleece or fake fur are always a safe bet. 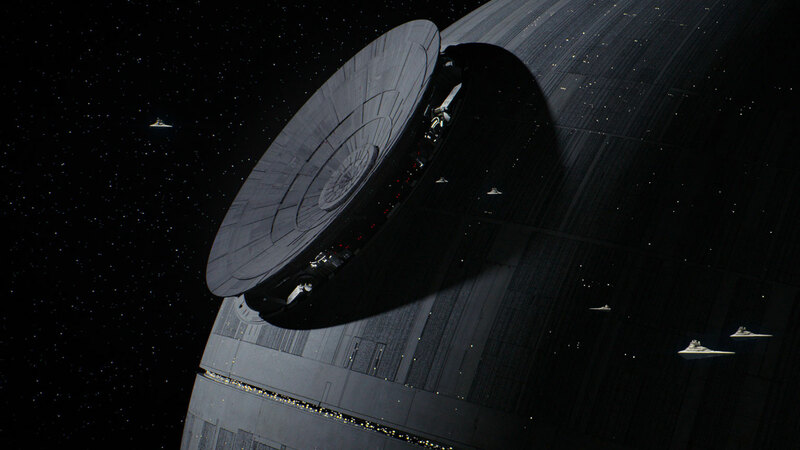 Synthetic fabric like polyester is often used to make pet cape costumes, like Darth Vader, or dresses, like Princess Leia’s in A New Hope. I have learned that my dog prefers fleece and fake fur fabric over polyester costumes. It all depends on your pet’s personality. If you have your heart set on that Lando Calrissian dog costume, try it on your pet. But if they give you a look that seems to say “This deal is getting worse all the time,” it might be time to ditch the cape. 3. 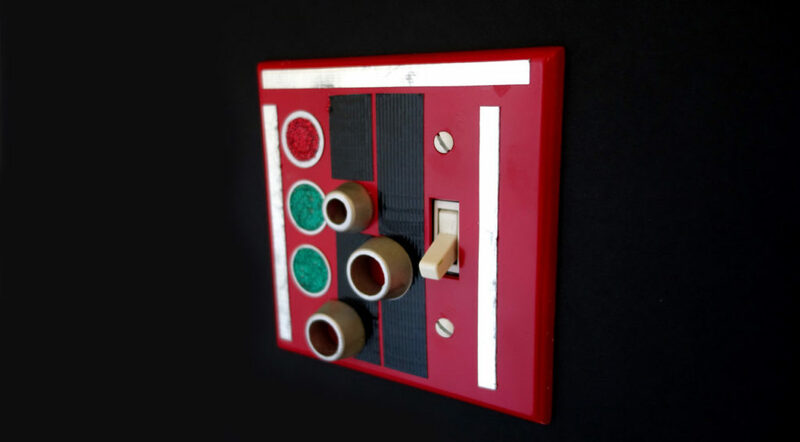 DIY or store bought? There are so many choices when it comes to Star Wars costumes for pets. You can find lots of affordable options online and in pet stores. The great thing about buying a pet costume from a store is that it comes in multiple sizes to ensure the best fit for your pet. 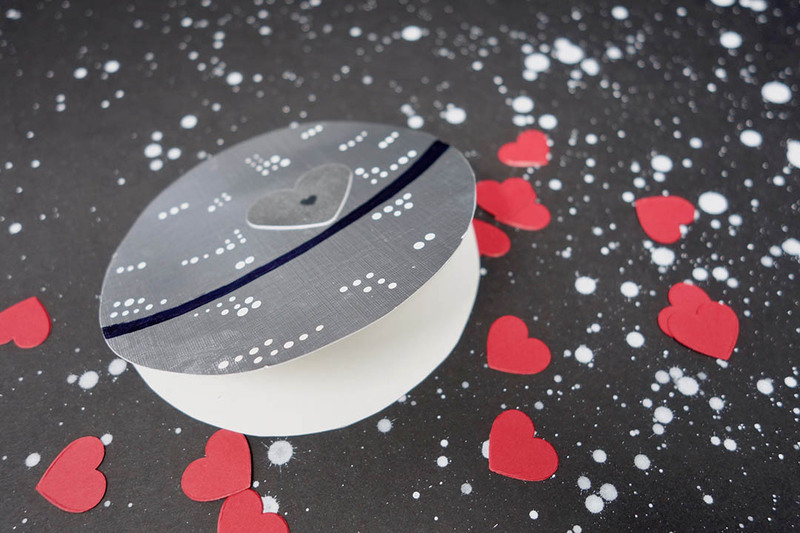 If you’re looking for a Star Wars pet costume that is outside of the box, like a Star Destroyer or TIE Fighter, DIY’ing it will be your best bet. Just make sure that whatever costume you choose, your pet can move freely and breathe easily. 4. Limit the amount of time in costume. Your pet may not mind wearing that cardboard Boba Fett jetpack at first, but after 5 minutes, your pup may show you that they’ve had enough. No matter how cute your pooch looks in their getup, it’s only fun if they’re comfortable, too. If they have trouble walking, if they keep scratching themselves, or try to bite the costume, that’s your cue to step in. Even cozy costumes made of fleece can become uncomfortable over time so always keep an eye on your pet. 5. Be a dynamic duo. Couples costumes aren’t just for humans, so why not match your pet? 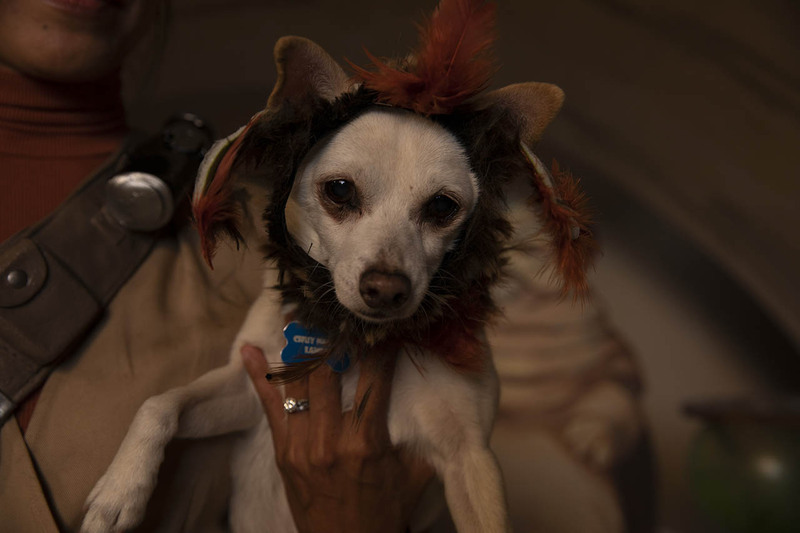 Dress up as Luke Skywalker on Dagobah to match your dog’s Yoda costume. Be the AT-AT driver to your dog the AT-AT. Even if your pet is wearing a simple Star Wars costume, like a set of Leia buns, it will all make sense when you show up in a Chewbacca fur suit. 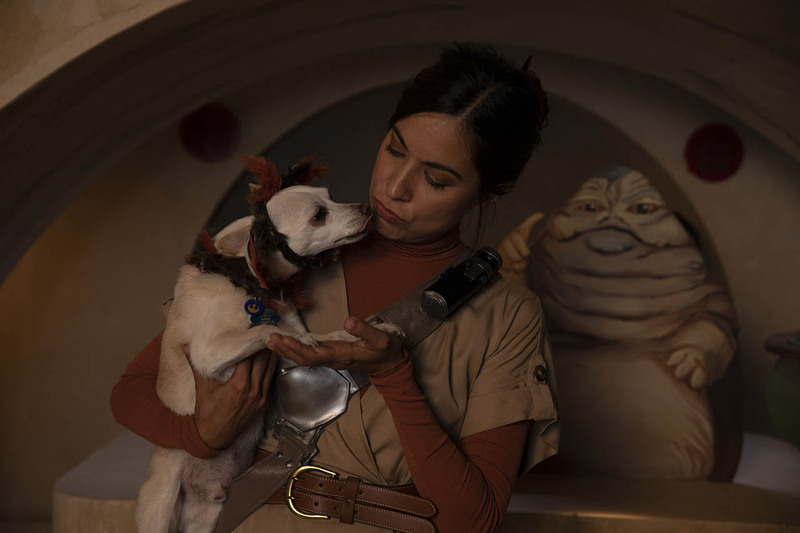 Giving your pet a Star Wars makeover can be a fun experience for you and your furry companion. Just remember that when you get them into character, always listen to your co-pilot’s grunts, growls, and barks. 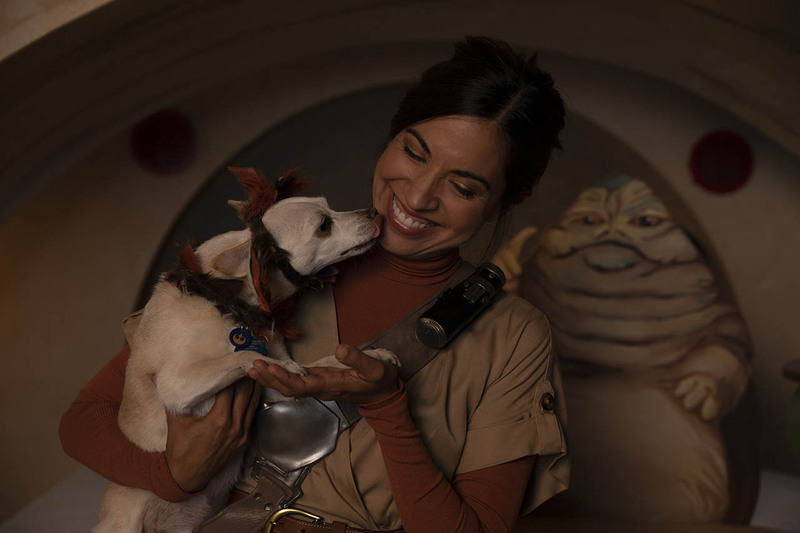 Catch up on all the episodes of Star Wars Pet Makeovers on Oh My Disney’s YouTube channel. Jennifer Landa is an actress, host, and crafter. 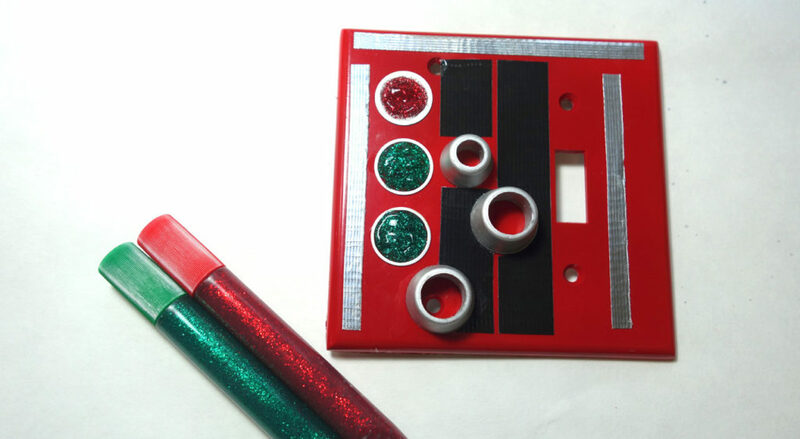 Follow her on Twitter @JenniferLanda and for more Star Wars DIYs, visit her YouTube channel. 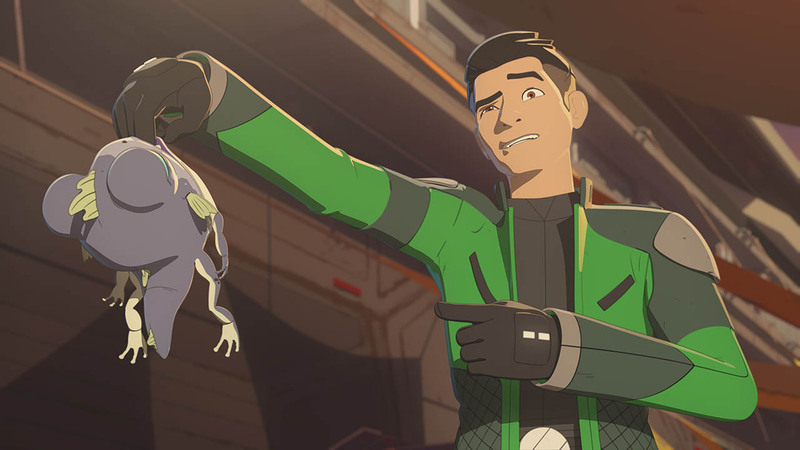 The Colossus platform in Star Wars Resistance may be filled with hotshot pilots and brilliant mechanics, but there’s one crew member who goes largely unnoticed and unappreciated — until now! Opeepit, the humble Frigosian maintenance worker, is definitely keeping an eye on Kaz. 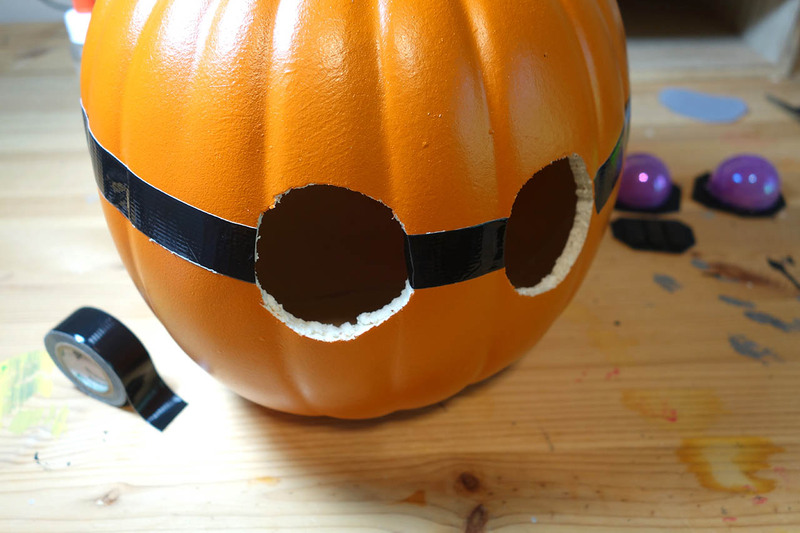 And if you need someone to keep a watchful eye on unruly trick-or-treaters, you can make a pumpkin that looks just like the hardworking hero to make sure things don’t get too out of hand this Halloween. Step 1: Paint the stem of the craft pumpkin with the acrylic gray paint. Let dry completely. Step 2: Separate the top and bottoms of the Easter eggs and discard the tops. Trace the bottom of one egg with the chalk on the middle of the pumpkin, making two circles for Opeepit’s eyes about two inches apart. Cut out the circles, and one small circle in the bottom of the pumpkin (for adding and removing the LED light) with the pumpkin carving knife. 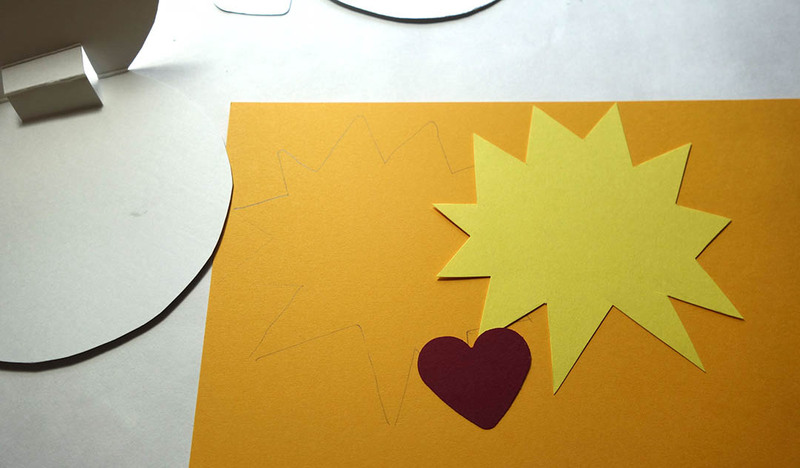 Step 3: Print and cut out the shapes on the provided template. Trace the L and R eyes, and the larger shape below them, on the backing of the black glitter craft foam. Cut out the shapes. 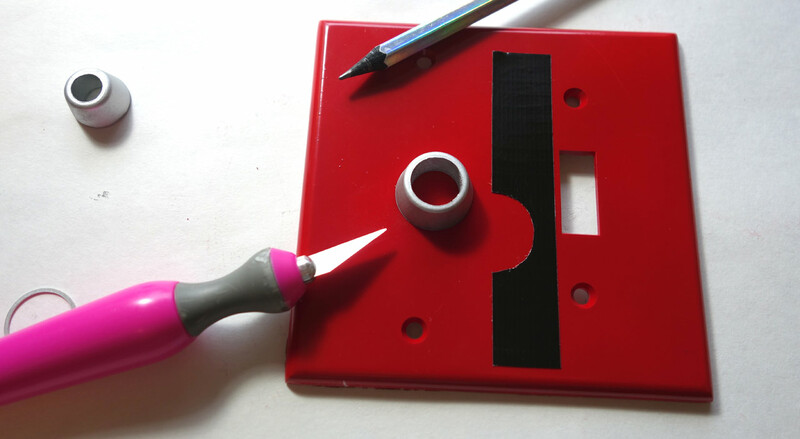 Step 4: Cut three strips of the plain black craft foam, about a quarter of an inch wide and one inch long. 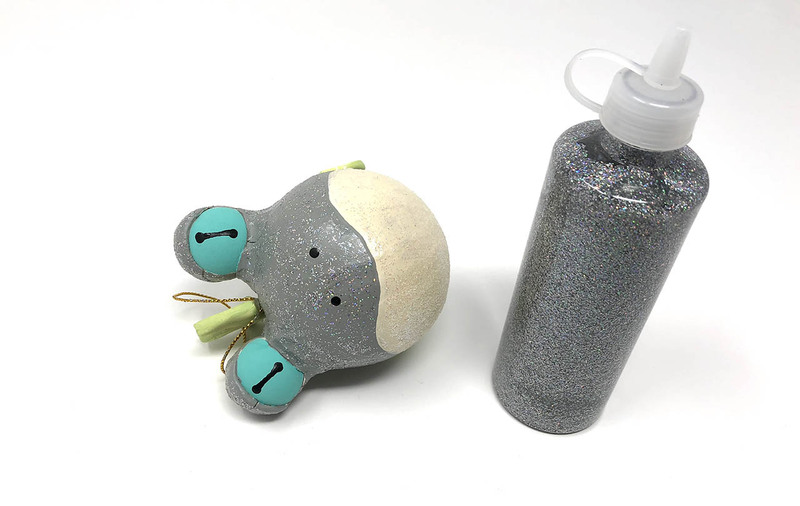 Glue them in the middle of the nose glitter foam shape and let dry. 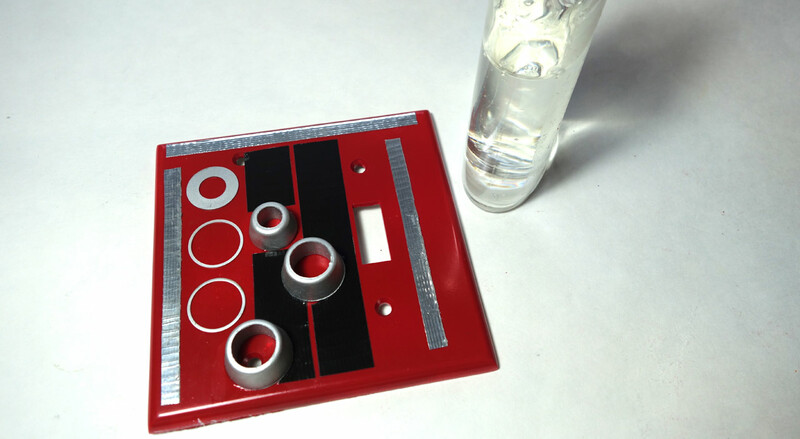 Step 5: Next, use the craft knife to cut small openings in the middle of the L and R eye craft foam shapes. 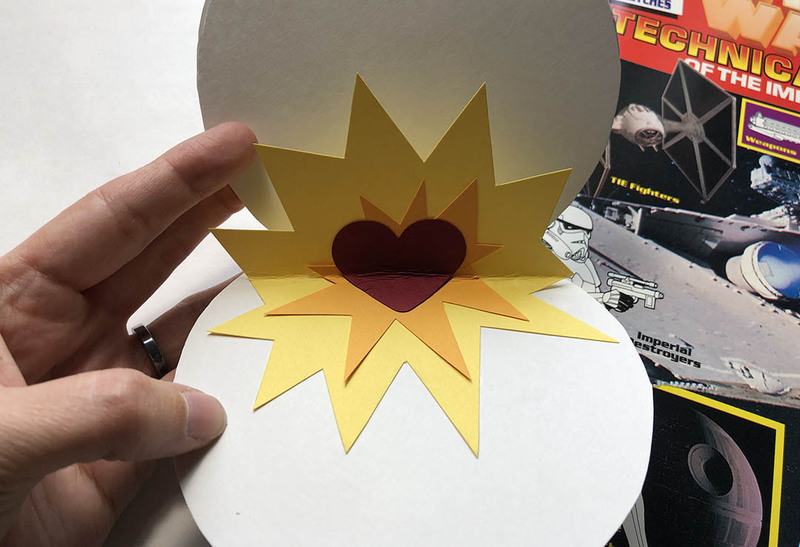 Make sure the cut-out shapes are small enough to be hidden by the Easter eggs. 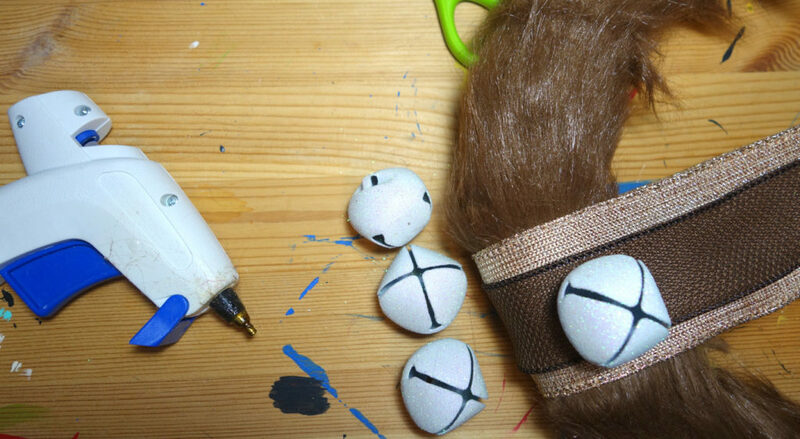 Step 7: Glue the Easter eggs to the L and R eye shapes and let dry completely. 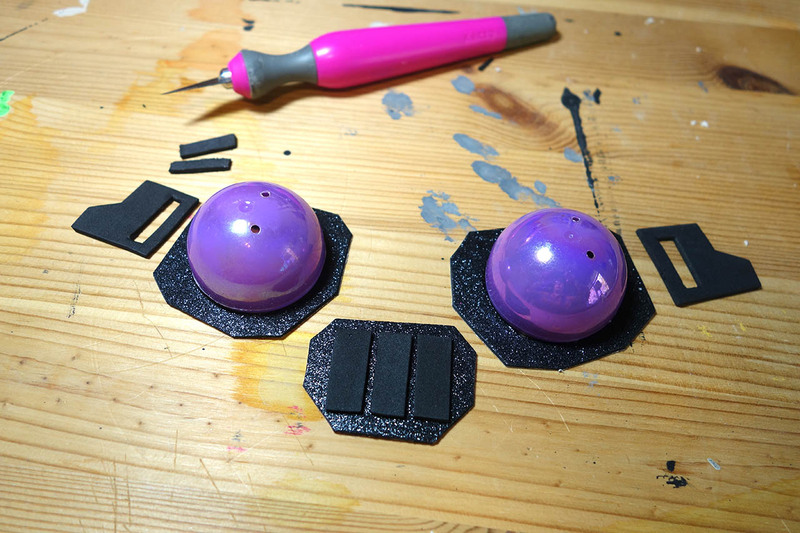 Step 8: Trace and cut out the two buckle shapes on the plain craft foam. 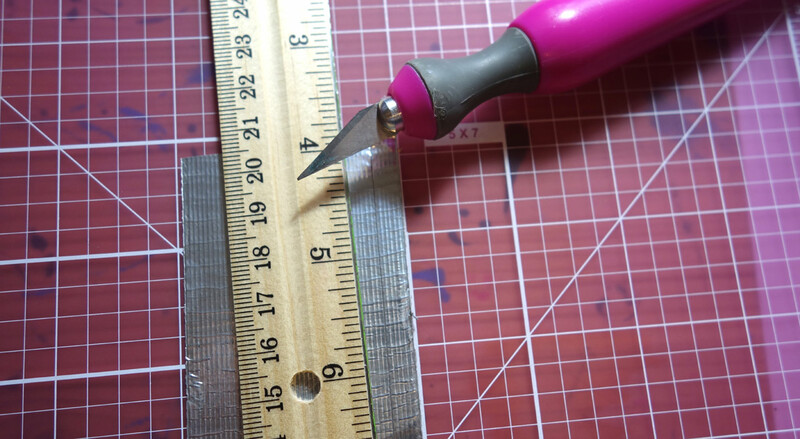 Use the craft knife to cut two small rectangles out of each. Step 9: It’s time to assemble Opeepit! 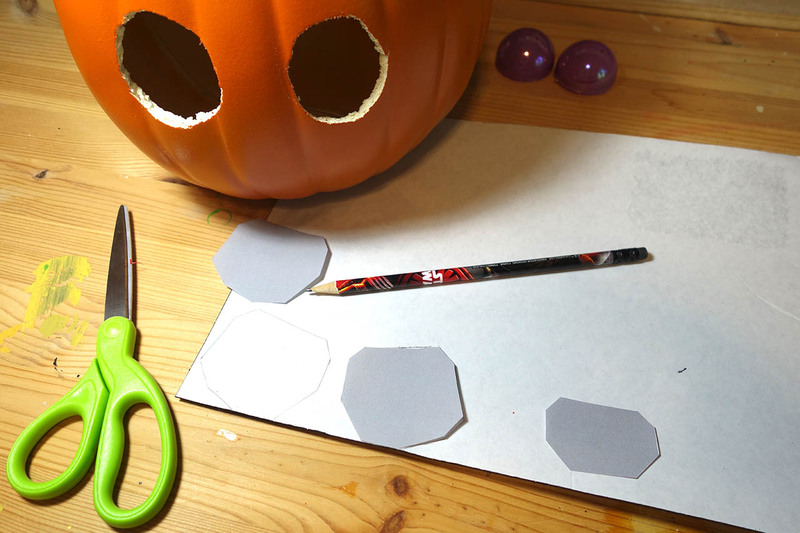 Remove the adhesive backing from the foam pieces and stick the eyes and nose to the pumpkin, completely covering the two circles you cut in the pumpkin previously. Glue the two buckle pieces on either side of the eyes. Let the glue dry. 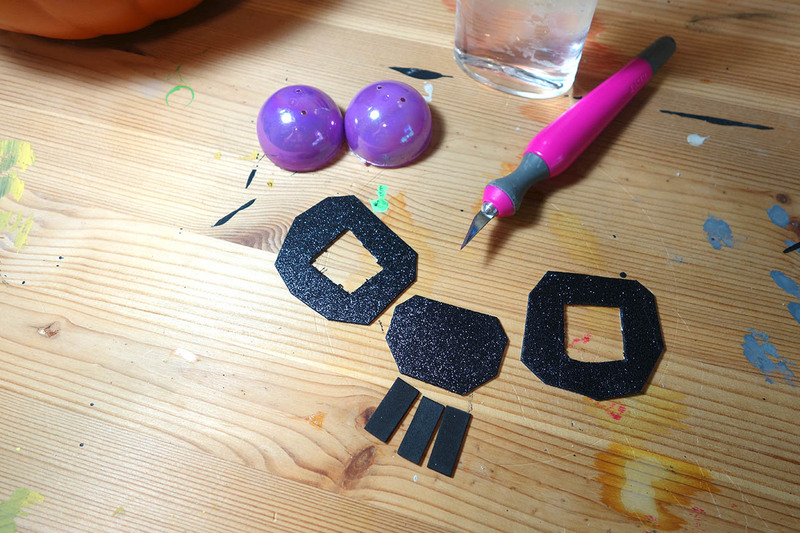 Step 10: Finally, use the black permanent marker to draw fur shapes all around the pumpkin. (Did you know Frigosians are actually quite fuzzy?) 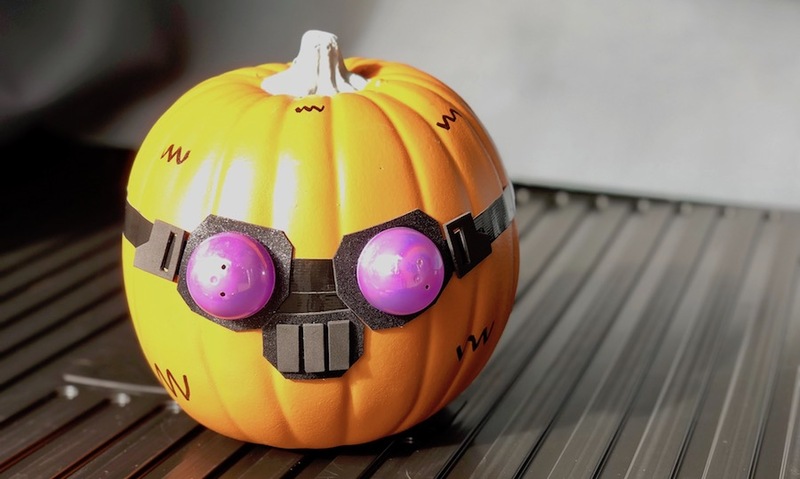 Your Star Wars Resistance pumpkin is complete. 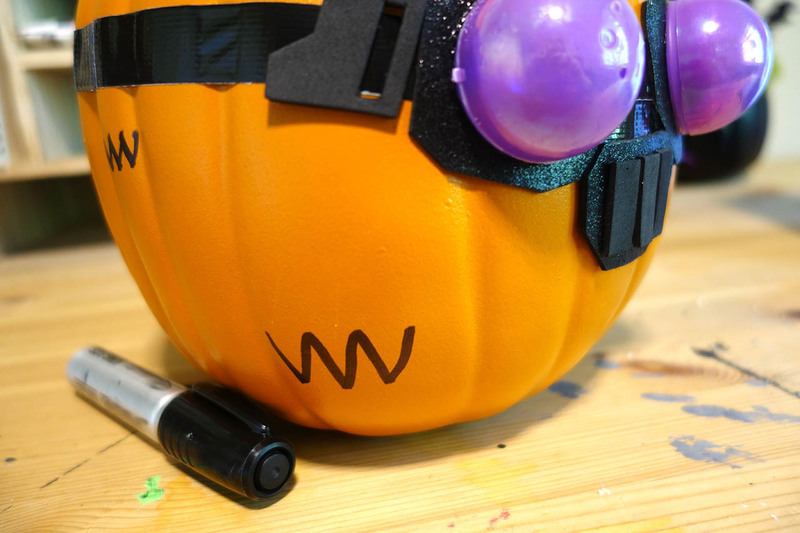 Slide the LED light into the pumpkin and in the dark the goggles will glower at anyone who dares make a mess!